Click and Save. Why pay $35-$70 for a single website template? Download all Dream Template's professionally designed web templates! Each template works out at just 6 cents! 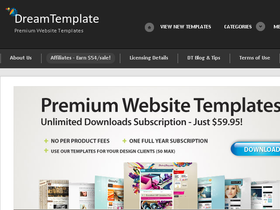 Unlimited access to the world's #1 premium web templates subscription store for only $59.95. Normally $149! Subscribe to Dream Template for an unlimited access membership upon account registration. Preview and download all the website templates featured on this site - almost immediately!